Despite getting hit by early blight, septoria leaf spot, and late blight, our tomatoes are still plugging away. We've met our quota of spaghetti sauce and pizza sauce frozen for the winter, have run out of days hot enough to dry whole tomatoes, and can only make two batches of harvest catch-all soup per week since I didn't plant enough parsley this spring. Time to experiment with ketchup! The internet is chock full of ketchup recipes, so it took me a while to discover a recipe that tasted a lot like the stuff in the grocery store's squeeze bottles. (Yes, we have unsophisticated tastes when it comes to ketchup.) The recipe that follows is quite mild, so you might decide to increase the seasonings, or perhaps add some of the alternate spices found in other recipes --- celery, cloves, hot peppers, cinnamon, paprika, ground mustard, etc. 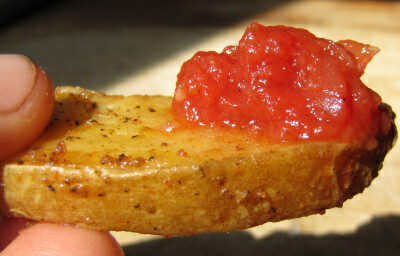 If you've developed your own ketchup recipe, please tell me about it in the comments! For my simple recipe, you start with a medium-sized bowl full of ripe roma tomatoes. Cut off the tops and any bad spots and blend in the food processor until liquified. 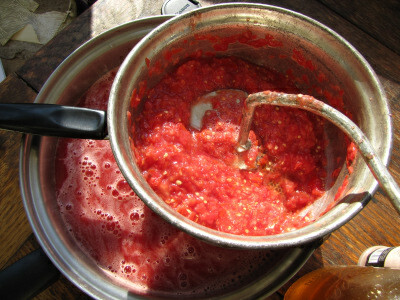 Pass the blended tomatoes through a foley mill to remove seeds and skin. You should now have a large skillet mostly full of thick tomato juice. Next, remove the exterior skins from 2 cloves of garlic and 1.5 large onions. 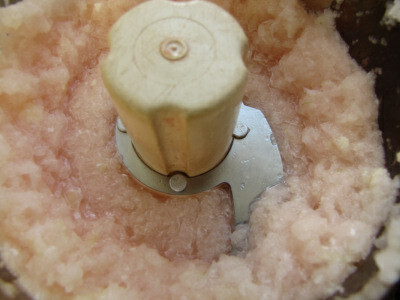 Cut into pieces small enough to fit into the food processor and blend until liquified. 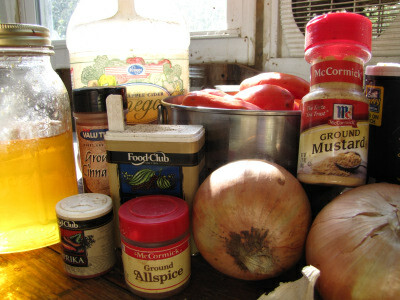 Add the blended garlic and onions to the tomatoes, along with 3 tablespoons of apple cider vinegar, 0.5 teaspoons of allspice, 2 teaspoons of salt, and 4.5 tablespoons of honey. Cook on high heat, stirring as necessary, until the mixture resembles ketchup --- about an hour. Allow the ketchup to sit in the fridge for a couple of hours before tasting it. Then make some baked sweet and white potato fries and dig in! This recipe makes about 2.75 cups of ketchup. Since you don't put in corn syrup and do use all fresh vegetables, I tend to agree with Ronald Reagan and consider it a vegetable (although a very small serving of one.) 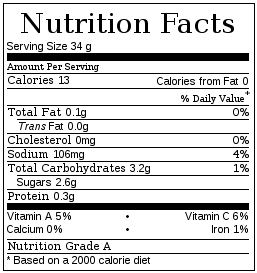 Compared to storebought ketchup, this concoction has about half the salt, two-thirds of the sugars, and a third again as many vitamins and minerals. Our homemade chicken waterer is great in coops or tractors. I used white sugar instead of agave nectar (no agave in the house), and I did about 3/4 (of the amount given in the recipe) cider vinegar and 1/4 white vinegar. It came out pretty well, especially given that it's my first ketchup. I'll be fiddling with it more before too long. I rarely use tomato paste because there's a metallic taste to it that neither I nor my husband like, so I'll probably use tomato sauce, possibly pureed tomatoes. I'm also planning to use homegrown garlic and onions as they come in. Someday I hope to use homegrown tomatoes, but it sure won't be this year! I also want to find a way to make the ketchup I like, and then be able to can it so it doesn't have to take up space in the freezer. That actually looks a lot like the recipe I started with, before I combined all the sweeteners together and converted them to honey, converted the paste to real tomatoes, and converted the powders to real garlic and onions. I hear that you can hot-water-bath can ketchup, though don't take my word for it!